The ABX Allocated Bullion Exchange brings together institutional trading of physical precious metals facilitated by price discovery through centrally cleared facility of trades globally. This global trading facility is brought together into a single trading environment accessible by both ABX members and clients through a dedicated and ground-breaking online exchange trading platform, MetalDesk. Being the first and leading institutional exchange for allocated physical precious metals, ABX Allocated Bullion Exchange gives everyone everywhere direct access to 7 major global wholesale precious metals markets, and 2 further national ones, allowing all bullion liquidity providers and takers to be connected together on a single platform. For a comprehensive overview of the exchange, see our page on the various process, functions and services that occur within the ABX. The ABX Allocated Bullion Exchange purpose and intention is not just to modernise the way physical precious metals markets work, but to also globalise them. This globalisation process will redefine the way that physical bullion is traded. Aren't Bullion Markets Already Globalised? To-date the physical precious metal markets have characteristics that more resemble cottage industries than global marketplaces. These bullion markets trade huge amounts of physical gold bullion and silver but are not easily accessible. 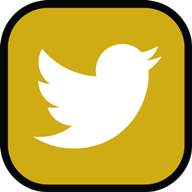 On top of this inaccessibility, these bullion markets also don’t interact with each other in a way that you would normally associate global entities to do. This means that investors, both private and corporate, found it very difficult to get access to, trade and own physical bullion. If they did manage to get access then it wouldn’t be at the favourable wholesale prices enjoyed by the major financial institutions. 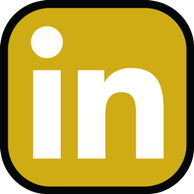 The important part of this globalisation process is the connection of all of the major global liquidity centres under a unified online platform (MetalDesk) which is designed to break down the barriers to entering all of those global wholesale physical precious metals markets. For such globalised market structure to work efficiently, it requires an integral internal central clearing and settlement system, which ABX has at its core and a state-of-the-art storage and logistics network. In total there are 9 physical precious metals markets that investors can chose to trade on. These markets are split into 2 groups based on the currency used; United States Dollar (USD) & Australian Dollar (AUD). There are 7 bullion marketplace accessible using the USD. These markets are the largest global trading hubs for physical precious metal in the world. 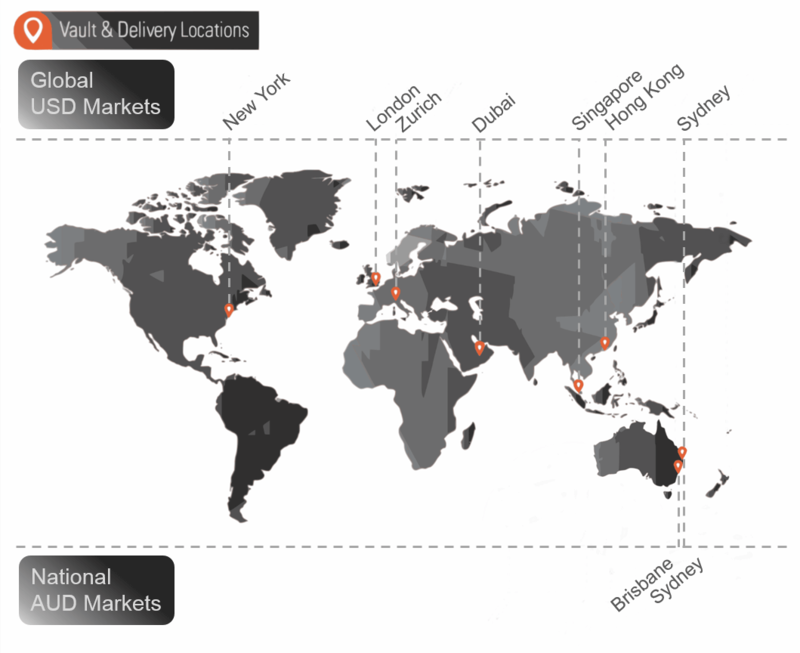 The AUD bullion marketplaces are national ones, but they cover the main trading cities in Australia. The markets available on ABX Allocated Bullion Exchange are open for trading for each business day Monday to Friday from 10:00-16:00 local time, for each respective vault location. Due to the spread of the markets throughout the global time zones, this amounts to 23 hours of continuous trading across the world. There is a 15 minute pause in MetalDesk pre-LBMA opening. The global physical locations and time zone coverage of the combined bullion markets that you can access through GoldVu, makes this a truly global institutional physical precious metals exchange. Why Use a Global Allocated Bullion Exchange? In the physical bullion trading industry, the majority of Western investing institutions and private individuals will only have the limited benefit of access to 1-2 precious metals markets; predominantly New York and London. Limited market choice (irrespective of sector) invariably results in paying over-the-odds on a narrow selection of products. Investors need to have access to a wide variety of markets and products so that competitive market forces provides for true value investing. Furthermore, as ABX Allocated Bullion Exchange encompasses markets that span 7 countries across 4 continents, investors can benefit from trading potential price arbitrage due to differing local market conditions. Institutions and brokers can take advantage of our allocated bullion solutions that allow them to seamlessly integrate with the exchange using our full brokerage trading platform that they can then offer downstream to their own clients. Many investors that successfully manage to gain access to the bullion markets will buy a precious metal such as gold bullion but not realise that it is in an unallocated form. Unallocated does not necessarily mean that the bullion was physically bought and stored for you. In fact the bullion will be encumbered by a 3rd party and you will be classified as a creditor and not the direct owner of the bullion. Allocated means that for each unit of bullion bought by the investor, a corresponding unit of real physical bullion exists in the vault that is wholly owned by you alone and you retain direct title to that asset with no-one else having a claim on it (i.e. unencumbered by a 3rd party). 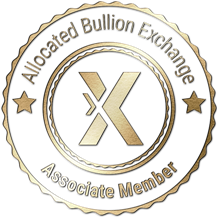 The 'Allocated' part of the exchange is a critical feature of the ABX Allocated Bullion Exchange and an incredibly important benefit to the investor because it mitigates 3rd party risk and gives you the full wealth preservation benefits that physical bullion provides. 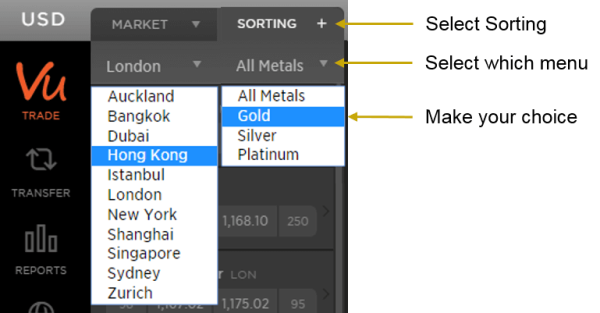 Choosing and accessing all the various global bullion marketplaces within the ABX Allocated Bullion Exchange is extremely simple to do on MetalDesk. The application’s user interface is driven by simple drop-down menus that you use to select the market you want to access and, if you want, the specific metal type you are interested in to trade. The system remembers your last selection when you log out. Through MetalDesk, ABX seeks to achieve its mission to provide a global and allocated bullion exchange that is modern, integrated and scalable. The electronic bullion exchange is designed to be an alternative global marketplace that redefines the way that the world trades physical precious metals. For further information about the background of the ABX, see our page on its concepts, origins and companies involved.